« The State Legislature passed a transportation budget. Here’s what that means for a biking project near you. Guest blogger David Killmon is active on Twitter as @kohidave. Mount Rainier viewed from Tacoma. The fruits of our efforts! Photographed by Eileen. Friday night and the weather for the weekend looks great. My associates and I are huddled around a table at the Tippe and Drague on Beacon Hill, wondering what to do this weekend. Obviously we wanted to ride our bikes, but where? 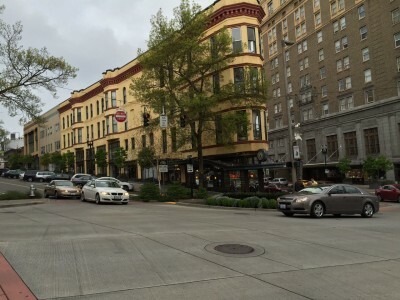 From Seattle, there are tons of fun destinations we can hit with some decent mileage. Typically we head north to the Woodville/Redmond area, or occasionally east towards Snoqualmie, but we rarely head south. 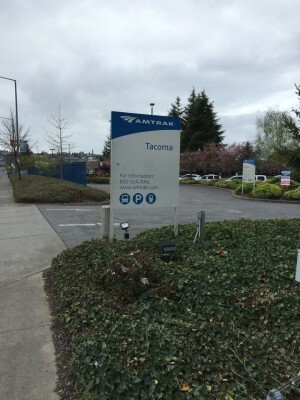 We flirted with the idea of trotting down to Olympia, but after some more discussion, we decided to head to the original terminus to the Trans Continental and visit Tacoma. To make it a real adventure, we booked a hotel and started frantically started looking up routes. We had three options to get to Tacoma from Seattle. 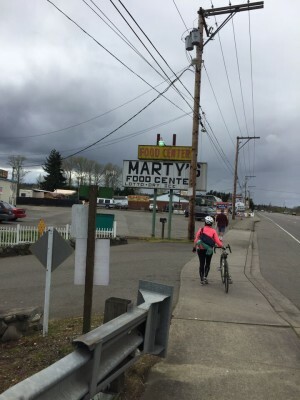 We could head south on the Interurban which took us a good bit of the way, but for the last 20 miles of road riding, we’d have to rely on Google Maps. 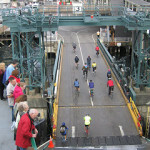 We could take the ferry to Vashon Island, ride down the Vashon Highway, and take the ferry to Tacoma. Finally, and this was an interesting one, we could take the ferry to the Kitsap peninsula, ride down the coast, and cross the Tacoma Narrows bridge into the city. I tweeted the cool cats @WABikes and asked for their suggestions. They were super awesome and retweeted, and I got a lot of feedback. The interurban was doable, but unremarkable. 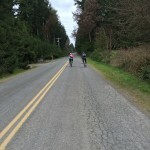 Vashon was beautiful and short, but hilly. 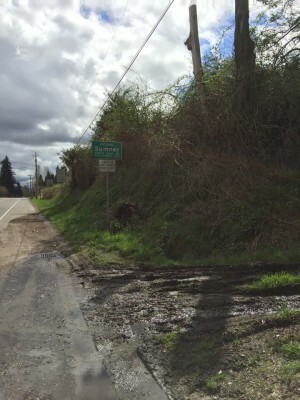 The route I was most interested in, via the Kitsap peninsula remained mysterious. 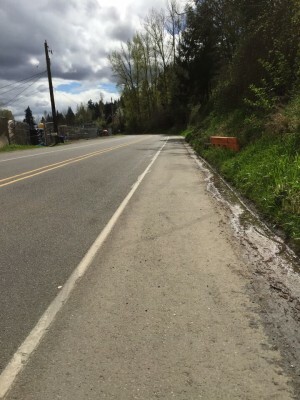 @WABikes mentioned that there were some “sticky” parts to the Kitsap route, and pointed me to an interesting article explaining the missing link. I figured we could save this more adventurous route until later in the season. We decided to go via the Interurban South and return via Vashon. 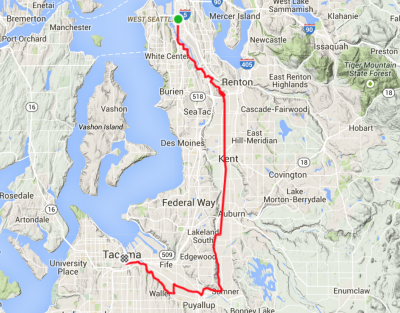 “@kohidave: @WAbikes any suggestions on a route from seattle to tacoma? ” Anyone want to share your favorite? That Saturday, I woke up early and rode down to Schooner Exact Brewery, where I’d be meeting my cohort. The day was blue and windy, and I was raring to go. I pulled up the Google Maps directions to Tacoma, but had no idea what to do after we got off the Interurban. It can be pretty exciting just riding somewhere — just heading down a path and hoping you get to where you’re headed. So that’s what we were going to do. 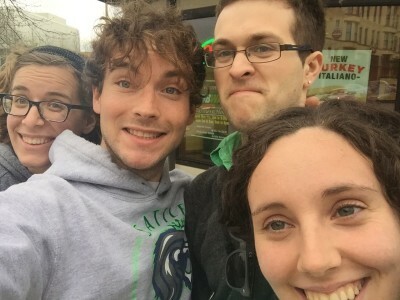 I met Sara and Eileen in the parking lot of Schooner Exact in SODO, where we shared a bagel and fantasized about the pizza we’d probably devour that night. 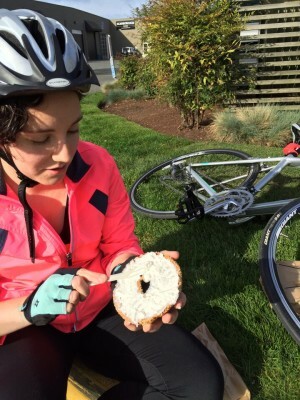 We grabbed our bikes, kicked the tires, and headed out on First Ave.
Elliott Bay Trail, Eileen and Sara with a bagel. 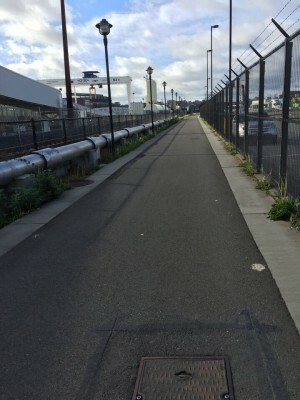 We crossed the First Avenue bridge, spanning the Duwamish River, on a separated bike and pedestrian path. We stopped to snap a few photos of the industrial backdrop that we’d come to share the rest of our trip with. There’s something about Seattle — even its industry is worth a photo. 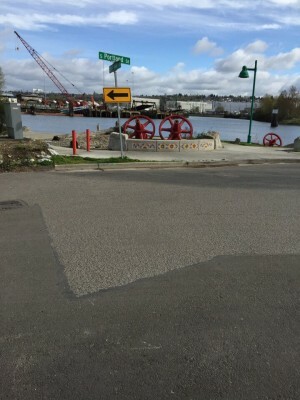 A quick selfie, the Duwamish, and art! We encountered a brand new protected bike lane after we got off the First Avenue bridge, and were delighted to find some random art at the end of it. We’d end up finding tons of little gems of character on our trip. The statue in the above shot looked to be reflecting the industry surrounding it; it was cute, trust me. We rode through neighborhood streets and found ourselves in South Park. It’s definitely a cool neighborhood and I wish we had time to stop. It’s awesome how many neighborhoods in your own back yard you discover on a bike. 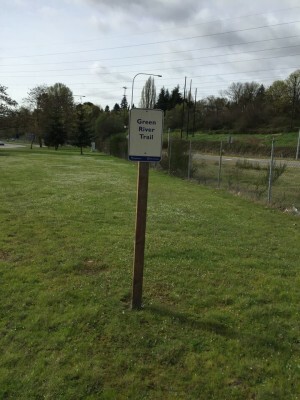 From South Park we headed towards the Green River Trail, which would take us to the Interurban. 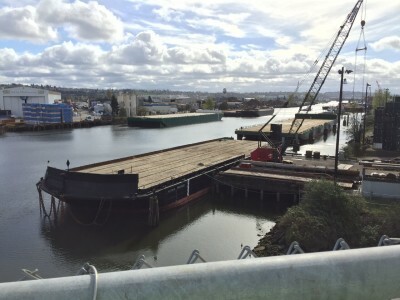 The Green River Trail follows along the — drum roll please — Green River, aka the Duwamish. It’s definitely an interesting river, one that’s changed shapes and character over the years. The Green River, as we know it today, would have been better known as the White River in the 1900s. The river was the product of the historic Green River (originating in the south) and White River (near Auburn) merging. However, in 1906, a huge flood caused the White River’s southern fork near Auburn to reverse direction and flow into the Puyallup, leaving behind only the Green River. In the north, the Green (or, back then the White) River forked. 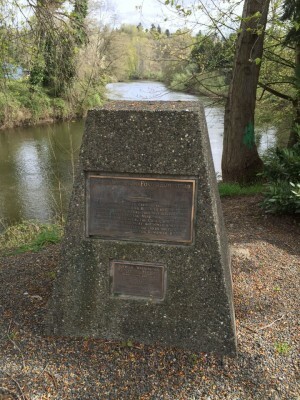 The western fork was called the Duwamish River and the eastern fork was the Black River. The Black River was unceremoniously dried up with the opening of the Lake Washington Ship Canal. 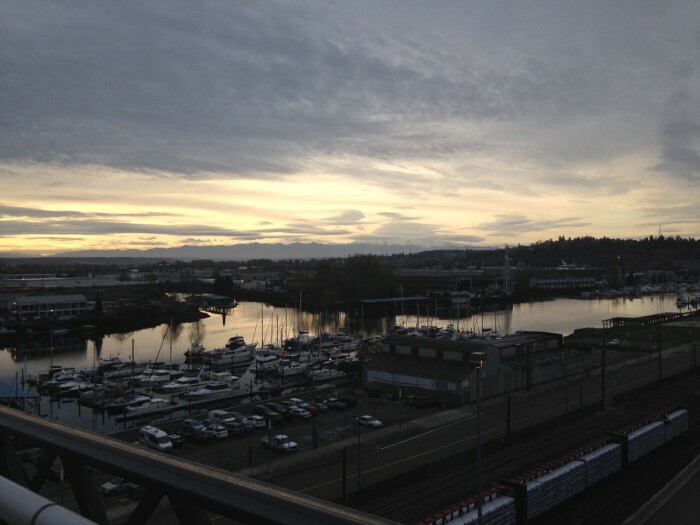 When the ship canal opened, it caused Lake Washington to drop nearly nine feet. The problem was, the Black River flowed out of Lake Washington, so with no more access to its water source, the Black River dried up. Now that there’s no more White River and no more Black River, the Green River and the Duwamish are the same river, hence the ‘aka’ earlier. And you thought this was just about a bike trip! 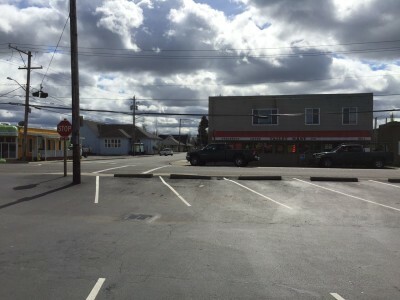 We passed through Fort Dent and merged onto the Interurban South. 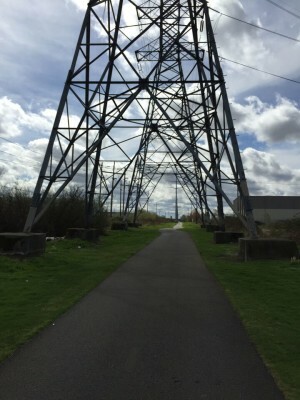 The trail is startled by huge power lines for most of its duration and follows along the Union Pacific train tracks. I can definitely see how it might not be particularly appealing to some, but to someone who’s kind of a big fan of trains, it was thrilling riding on a rail-to-trail next to real live, active train tracks. The trail has several at-grade crossings with active tracks, which can make for a cool scene of a train passing a bike path. Some sections of the path are also shouldered by wetlands with frogs and crickets. Mixed with the empty, overgrown backs of warehouses and the quiet railroad tracks, it was a surreal scene. The Interurban South might not be the most handsome of trails, but it really gives you a sense of transition. You’re leaving the city behind and you’re entering a land of in-between. We decided to stop around here to take a lunch break. We were the only people for miles. It was kind of great. 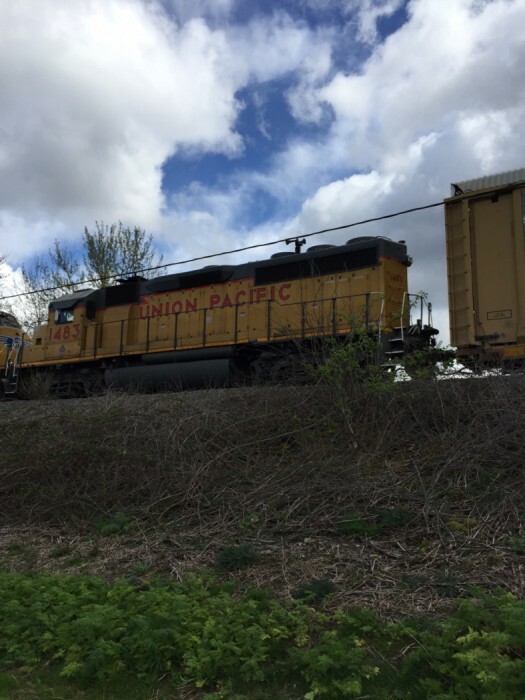 We pedaled down the flat trail, waiving to the train conductors (and some trains that were remote controlled?! 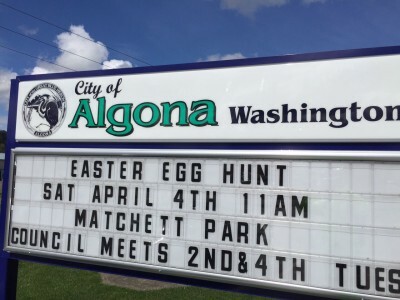 ), passing through a couple of towns on our way to beautiful Algona. We passed such awe inspiring sights as the Kent Shell Station, Auburn Supermall, and the only Porta-Potty on the entire trail. We rolled into Algona, sat down in a little park, pulled out our phones and our candy, and tried to figure out what to do next. 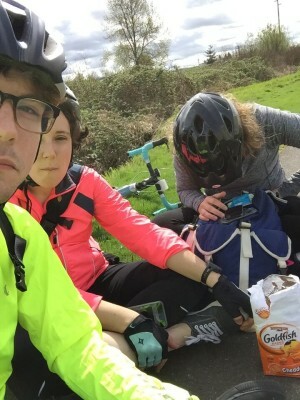 You see, for the past 20-ish miles, it had been pretty much one direction — but the Interurban was going to be ending soon, so we needed to consult the Google Maps on what to do next. We devoured our candy and hit the road. Goodbye scenic, quiet trails, hello access roads and shoulders. We headed west onto Valley Highway South, and then south through Pacific and Sumner. I’ve ridden on Valley Highway before during the STP, but I gotta say those tiny shoulders are a lot less welcoming without 10,000 of my nearest and dearest friends. It’s a pretty low traffic road, which was great, but the occasional truck speeding by while I tried my best to hug the “shoulder” was not particularly comfortable. It wasn’t that bad though, and just took a little bit of time to get used to being back on the road. A few miles later, we were back to smaller neighborhood streets and even the occasional bike lane! Google Maps suggested we cross the Puyallup River to the south side, and so we did. We were greeted by a cute little river path for a couple of miles. We were all pretty excited to be getting close to Tacoma. That pizza we were dreaming about at the start of our trip was really drawing us towards the city. Well, the river trail ended after a few miles, and I pulled out my phone to see what to do next. There was a nice solid green line on River Rd. East, so I walked out of the trail to find a five-lane highway. A five-lane highway with debris-filled, narrow shoulders. My friends and I saw a sidewalk on the other side and a break in the traffic, so we sprinted across. We rode on the sidewalk until that petered out, and we found ourselves with a bit of a dilemma. 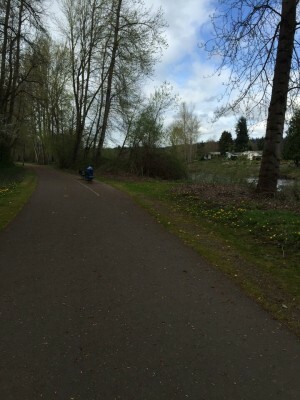 The cute Puyallup River Trail. The not-cute River Road East, Puyallup. We recalculated a bit and decided to try a new route. We walked to a stop light about a mile down the highway (walking in the shoulder), and turned on to 66th. What a difference a turn can make. 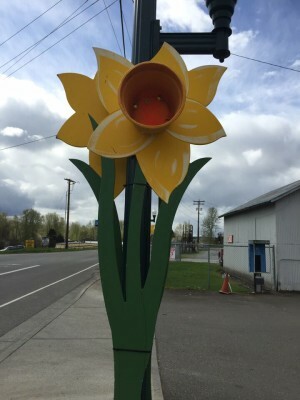 66th is a small, two-lane, charming country rode with the cranes of the Port of Tacoma dangling far in the distance. Eventually we turned onto Pioneer Avenue, a much calmer and wider-shouldered road which paralleled the Sounder tracks. Eventually we had to merge back onto River Road East for less than a mile and it was pretty hellacious. Merging was rough as cars weren’t really expecting us and didn’t know what to do with us, and the shoulder was pitted and full of potholes. Eventually though, we entered into Tacoma, victorious. Overall it was a pretty awesome trip. I would do something to avoid River Road East. Maybe stay on the north side of the Pyuallup River, or have gone a little bit further south and skipped the river trail in favor of neighborhood streets. Taking Pioneer, you don’t really get the sense that you’re approaching a city, you just sort of turn and there she is, which was a really cool sensation. Anyway, welcome to Tacoma! 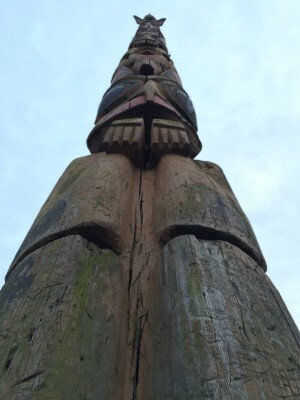 A beautiful city, some cute bikers, and an awesome totem pole. A small summary of our route. Feel free to check out our leisurely route on Strava! Picture of the map, not an actual Google Map. 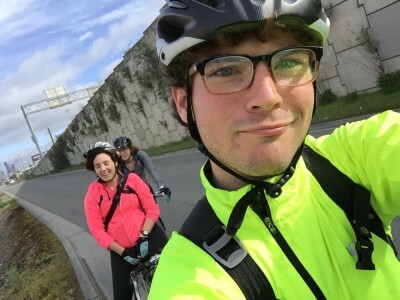 This post and the follow-up on bicycling from Tacoma to Seattle first appeared on Medium; reposted with permission. Watch for the return trip post. 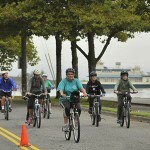 This article was posted in Adventure, News, Travel and tagged Algona, bike tours, bike travel, Green River Trail, Interurban South, Pacific, routes, Seattle, SODO Trail, Sumner, Tacoma, trails, trains, travel. Bookmark the permalink. Follow comments with the RSS feed for this post. Both comments and trackbacks are closed. River Road is an option I personally use because it has wide shoulder. Levy Road, south side of the River doesn’t have much shoulders. Pioneer is the other option and it has decent shoulders most of the way until you get past Walker Road and it squeezed down to nothing and the traffic picks up. We really need a better way to get into Tacoma. 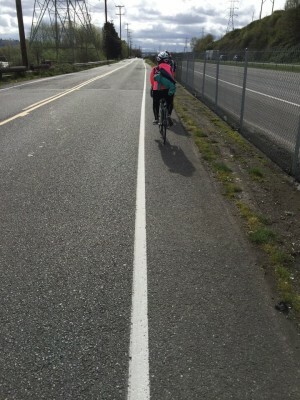 A really good, and fun, was is to go over Vashon Island. Stay on the Interurban through Algona and into Pacific. When the Interurban ends at 3rd Ave SW, turn left, ride east about half a mile, take a right on Milwaukee Blvd, just before Pacific City Hall. South on Milwaukee to County Line Road, then left/east for a block to Valentine Ave.
East again on Stewart. If traffic is heavy, you might be more comfortable waiting just shy of the bridge across the White River until eastbound Stewart has a red light again, so you’ll have clear sailing over the narrow bridge. 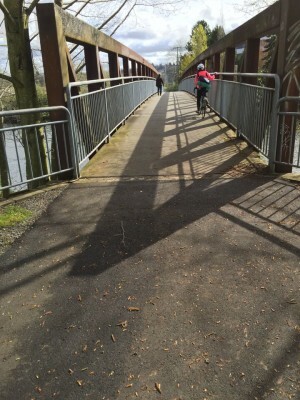 Just past the bridge, keep an eye to your right for the Sumner Link Trail, and you’ll have a beautiful ride south along the lower White River to Puyallup. Thanks, Josh. 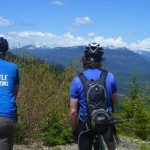 Great to get a local rider’s recommendations. We’ll try to remember to ping you on Twitter the next time someone asks for route advice around Pacific. Yea, I don’t know if there’s a better connection into the city, maybe the other side of the Puyallup is better? I just sort of blindly followed Google Maps. Anyway it was a small hiccup in an otherwise great ride. Thanks for the story! 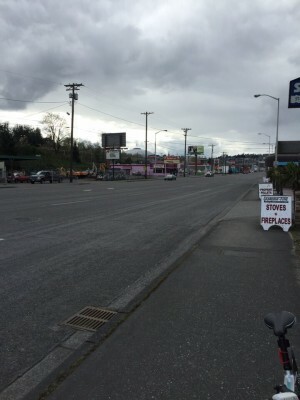 I just did a similar ride to Lakewood from Capitol Hill to visit my Mom on her birthday. Didn’t spend the night, though. Rather took the excellent bus service back to Seattle after dinner. 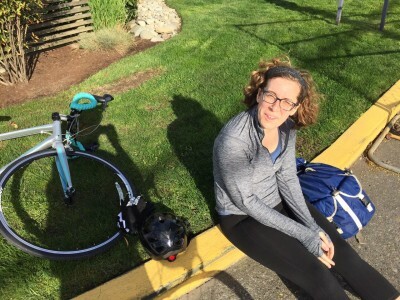 Bike + transit is an awesome way to extend your reach or wrap up a long day. You could take the train too, if the timing worked out for you. Cool! I’ve thought about making this trip, but was too concerned about that last hairy connection into Tacoma. So many great trails south of Seattle, shame they don’t quite link up safely with Tacoma. Thanks for the write-up.